Trumpets of joy at this briliant survey exhibition by Texan bad-boy Peter Saul. For many years, Saul taught in Texas and is now living in New Hampshire. 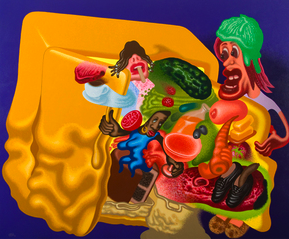 His satiric antics are in full play in the twenty paintings of this show. Painter Susanna Coffey commented that the paintings looked immediate, as if done yesterday--and are loaded with visual ideas: flat, blocky areas of color surrounded melting refrigerators or jets, pearlescent, pellet-like teeth and sponge-like die. It's hard to know where to land first: juicy refrigerator still lifes, with striped and checkered backgrounds, linseed oil still looking wet on the surfaces; the razor-sharp articulation of "Columbus Discovers America," 1992-5, in which low, muted color sweeps into a Byzantine goldmine of yellows and Indian reds that turns out to be a group of women in chains; or the tour-de-force painting of cops on a subway crash epic from 1979, or the weird and furry paintings Saul is doing now. The overriding impression is, what a colorist. The second is, look at those edges! The longer you look, the more rewarding, on a purely visual level, the paintings become. Saul lived and worked in Europe for eight years, returning to the San Francisco Bay Area in 1964. He states in the exhibition catalogue that Americans weren't really studying their culture yet, so he was able to plumb its riches from afar. His work intersected with and/or likened to R. Crumb, the Hairy Who and Guston, and these intersections come immediately to mind when you see the paintings; they also conjure, from a greater distance, Leon Golub and Nancy Spero, also in Europe in the late 1950s.In the catalogue interview with Chris Byrne, Saul responds to a question about why he draws distortion: "I like to draw cartoony because it adds a feeling of movement." He adds, "a great many mistakes are a good thing because they slow down the viewing, and become interesting points to look at..." and cites an incident in London in 1956 when artist Pietro Annigoni was criticized for making one of the Queen's arms too long and Saul, with 20,000 others, stood on line to see it. Saul states, "like Ingres he was trying to stretch the body a little further. A few years later I began to think about this event: 20,000 people looking at a mistake." Saul's show is one of those that makes you wan to drop everything and paint.